It’s a curious thing. Mention the Charles Lamb to anyone familiar with Islington and you get one of two reactions. It’s either an immediate grin and an ‘omigodilovethatplace’, launching into stories of sneaky after work pints and lazy weekend lunches, or blank. Nothing. To those of you in the latter camp, you really should give the Charles Lamb a try. It’s tucked away behind Angel but utterly removed from the madness of Upper Street. 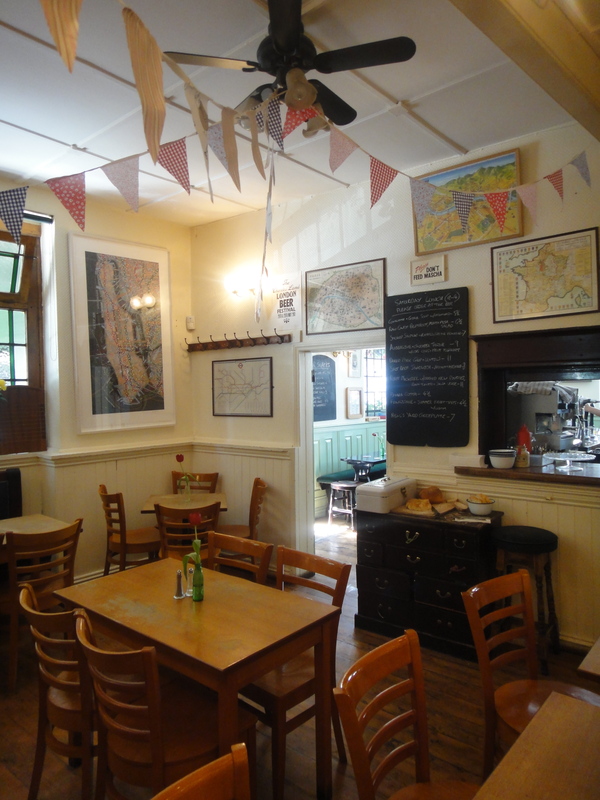 We went in on a Saturday – the obviously named Map room (also known as the Cheese room, as the lead glass window once served as a shop front from which cheese was sold) and the bar itself were empty when we arrived as everyone sat outside in the sunshine. We walked around reading the art works, lots of typography pieces including some from New North Press, and Steven Kenny’s Please Don’t Feed Mascha signs. They refer to the resident dog, whose art dealer owners have curated the wonderful collection on the walls. I liked the magnifying glass provided to properly examine the map of 1890s London poverty. Darren, the very affable manager, talked us through the menu of the day and also told us a little more about their suppliers. They buy locally (including Exeter St Bread and McKanna Meats) and seasonally as much as possible – many of the vendors they use call them on a daily basis to tell them what’s been caught or is good that day and they plan menus accordingly. As a result, the menu changes frequently and it’s a ‘first come first served’ mentality but their bar menu has some constants too. I started with a Fentiman’s Ginger beer as we were hot and sticky after the walk there, and the boy went for that traditional hangover vanquisher, the Bloody Mary. Turns out they liven it up with a dash of Caol Ila, which got the thumbs up – can’t bear tomato juice myself. We started on foccacia with a delicious fruity olive oil, waiting for the first course. 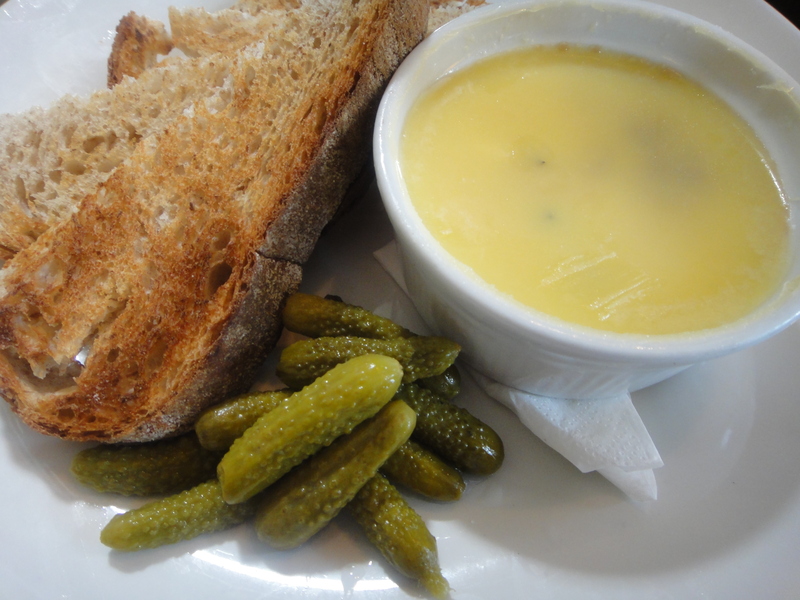 The Chicken liver pate from the bar menu was a very generous portion, and when we cracked the disc of buttermilk coloured fat on top there was warm, unctuous, velvety pate waiting underneath which came with heaps of cornichons and wedges of toast. 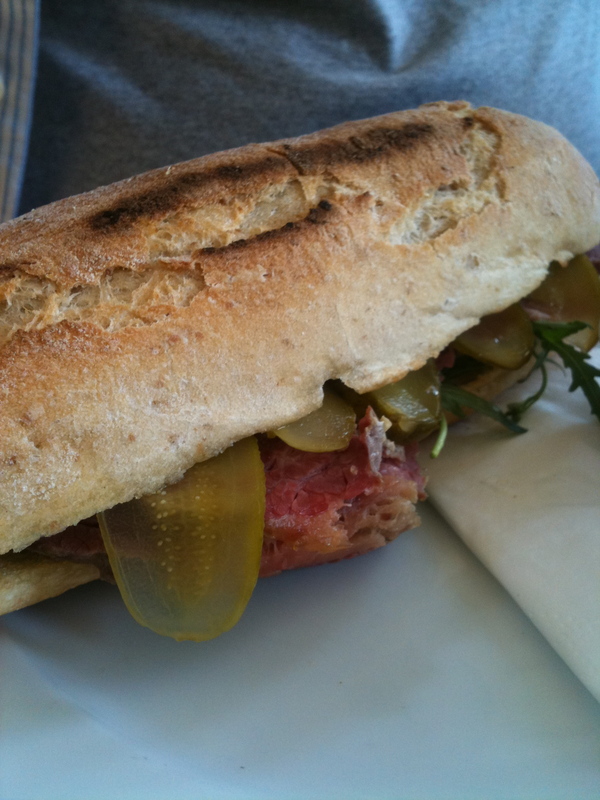 I went for the Raw candy beetroot, mint and feta salad (£6.50) while the boy ordered the Salt beef sandwich (£8) which had tongues of translucent pickle slices hanging out the side, and thick slices of juicy beef. The plan was to divide and share as usual but I found myself hanging on to the salad – this sort of thing doesn’t normally happen. The boy had a pint of the rather good Harviestoun Schiehallion to go with it – it won Best pilsner 2010 and was hoppy, rich, reminded me of a San Francisco craft beer. 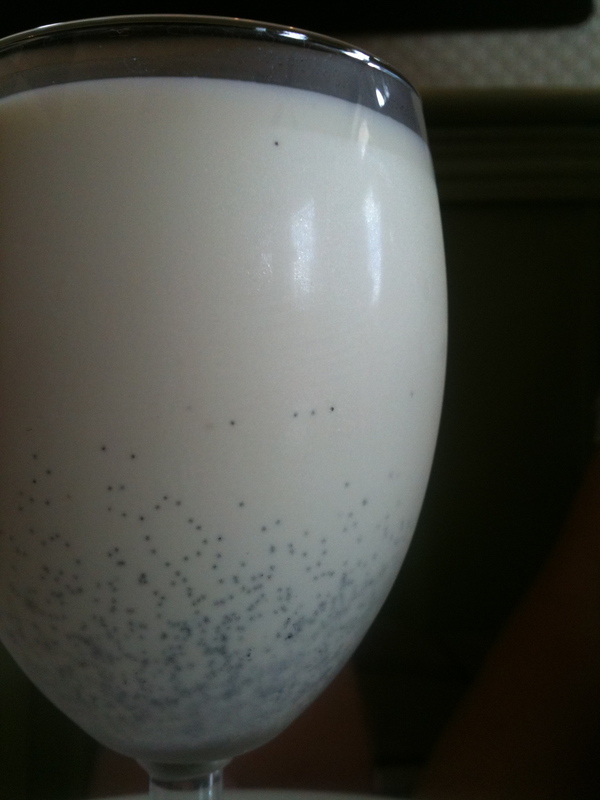 We were persuaded into desserts, the pannacotta was particularly popular and when it arrived it was a full wine glass with glorious speckles of vanilla bean showing through. 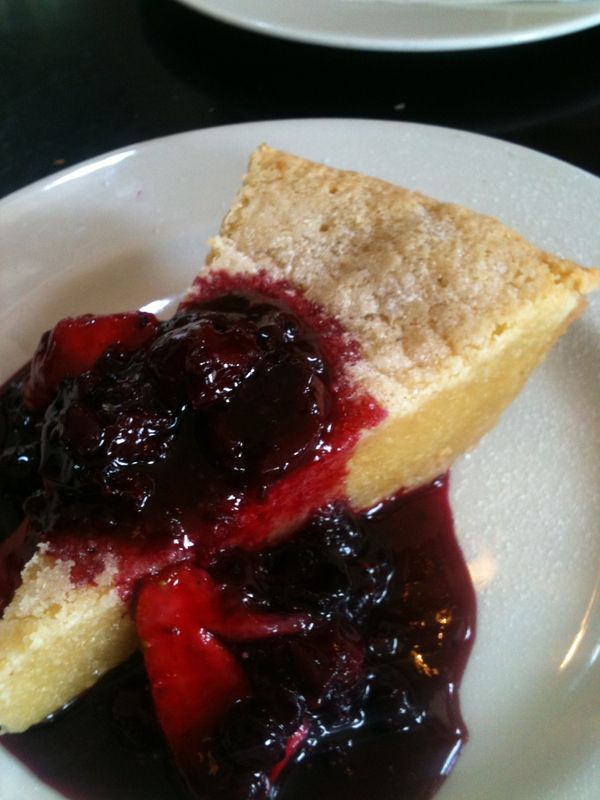 It emerged that I still hate pannacotta but I wouldn’t have been able to wrestle it away from the boy anyway and he really wouldn’t have had a look in at my frangipane tart with the sharpest imaginable red fruit coulis on top, which cut the sweetness perfectly. When we were in there, a couple of lost tourists who’d presumably come up from the nearby Regent’s Canal came in and asked what local beers they had. Darren replied almost innocently ‘Well, pretty much everything in here is local’. Then a woman came in saying she was looking for ‘Daniel and Charlie’ – Darren said he hadn’t seen them yet. Turns out she was referring to one of the regulars and his spaniel. We quizzed him about whether they do private hire (at the time we were looking for a pub to hold a party after our wedding) and he explained that as they are a local pub, and in a residential area, they only close the pub for regulars or neighbours. That way, he explains, if someone asks why they were closed on Wednesday night, he can say ‘Oh, No 15 were having a birthday party’ which is acceptable apparently. All I can say is, Elia St and its nearby residents are very lucky indeed. Thanks to Hannah at Story PR for arranging for us to visit. I’m in the blank camp but this sounds just the kind of place we love to visit together, for quiet lunches. We went to the Duke of Cambridge earlier this year, for the first time, and loved it, must go again, such a bloody marvellous place and truly delicious organic food and drink. Ah, in another life (this is 10 years ago) I used to frequent the DoC. Then moved further east and its sister pub, the Crown, was on our doorstep too. They sold it off though, don’t think it was quite right for the area at the time but it’s now been revamped. Happy memories! One of our favourite places in London!